Spiritisme, Magnetisme, Sciences et Arts . Paris, France. Language: French. Editor: Honorine Huet. 1/1, April 15, 1867-1/13, October 15, 1867(?) 4-6 pp., 10 fr. a year. Took over the subscription list of L'Avenir on the death of d'Ambel. 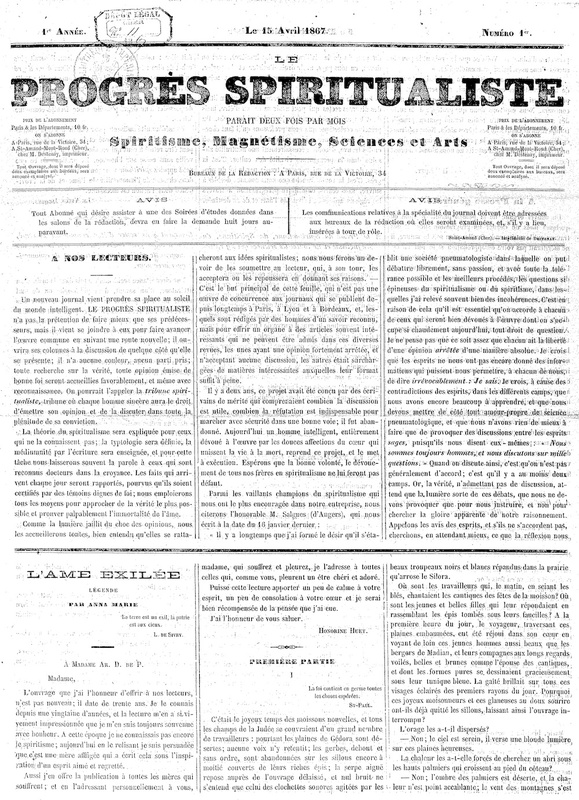 As the title indicated in using both spiritism and spiritualism, the journal attempted to stand independent of the predominant spiritism of Allan Kardec. It announced itself as "the spiritualist tribune where every sincere person would have the right to express his opinions and discuss them fully." The journal was the work of Mme Honorine Huet, a prominent Jewish medium for the antecedent L'Avenir and a "typtologue"—a medium specializing in communicating with spirits through table rappings—and the instructor of Theophile Gautier's daughter in magnetism. Contributions by Andre Pezzani and regular discussions of the relationship of magnetism and spiritualism. BNF.